Tax season can be stressful for the millions of Americans who owe money to Uncle Sam. Every year, the average U.S. household pays more than $5,700 in federal income taxes, according to the Bureau of Labor Statistics. And while we’re all faced with that same obligation, there is significant difference when it comes to state and local taxes. Taxpayers in the most tax-expensive states, for instance, pay three times more than those in the cheapest states. Surprisingly, though, low income taxes don’t always mean low taxes as a whole. For example, while the state of Washington’s citizens don’t pay income tax, they still end up spending over 8% of their annual income on sales and excise taxes. Texas residents also don’t pay income tax, but spend 1.86% of their income on real estate taxes, one of the highest rates in the country. Compare these to California, where residents owe a little over 4% of their income in sales and excise taxes, and just 0.79% in real estate tax. As this year’s tax-filing deadline, April 17, comes closer, it’s fair to wonder which states give their taxpayers more of a break. 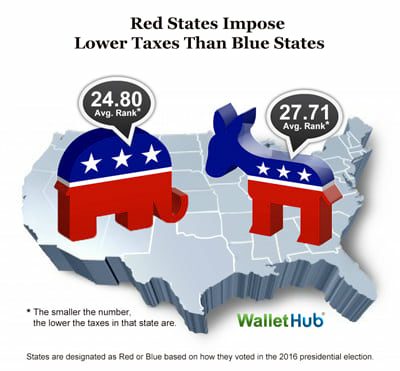 WalletHub searched for answers by comparing state and local tax rates in the 50 states and the District of Columbia against national medians. To illustrate, we calculated relative income-tax obligations by applying the effective income-tax rates in each state and locality to the average American’s income. Scroll down for the complete ranking, commentary from a panel of tax experts and a full description of our methodology. *Assumes “Median U.S. Household” has an annual income of $55,754 (mean third quintile U.S. income); owns a home valued at $184,700 (median U.S. home value); owns a car valued at $24,000 (the highest-selling car of 2017); and spends annually an amount equal to the spending of a household earning the median U.S. income. ***Assumes “Median State Household” has an annual income equal to the mean third quintile income of the state; owns a home at a value equal to the median of the state; owns a car valued at $24,000 (the highest-selling car of 2017); and spends annually an amount equal to the spending of a household earning the median state income. All effective tax rates shown below were calculated as a percentage of the mean third quintile U.S. income of $55,754 and based on the characteristics of the Median U.S. Household*. *Assumes “Median U.S. Household” has an income equal to $55,754 (mean third quintile U.S. income); owns a home valued at $184,700 (median U.S. home value); owns a car valued at $24,000 (the highest-selling car of 2017); and spends annually an amount equal to the spending of a household earning the median U.S. income. For more insight into the impact state and local taxes have on migration and public policy, we turned to a panel of leading tax and policy experts. You can check out their bios and responses below. Do people usually consider taxes when deciding where to live? Should they? How can state and local tax policy be used to attract new residents and stimulate growth? Which states have particularly complicated tax rules for families? How has the total amount families pay in state and local taxes changed as a result of the new tax code? 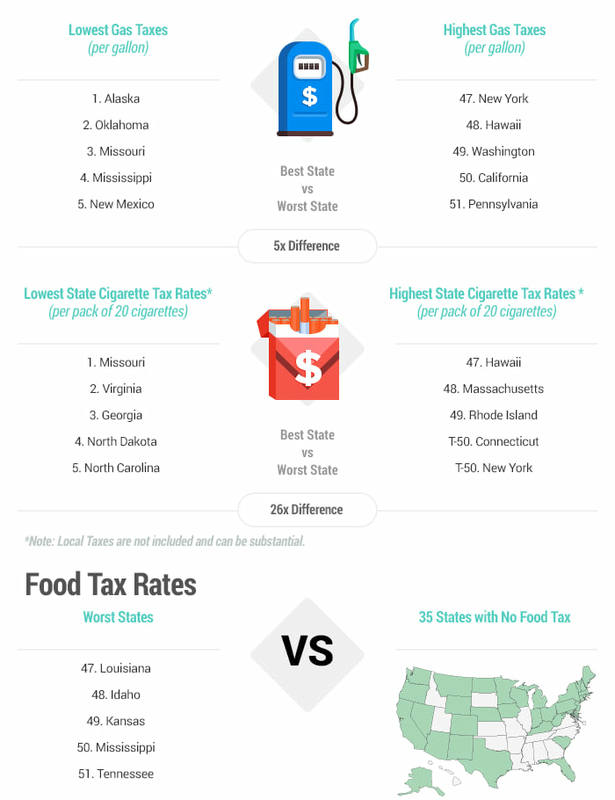 Which states have the best mix of taxes and government services? Should people pay taxes based on where they live or where they work? This entry was posted in Pound Ridge, Westchester NY and tagged Pound Ridge Luxury Real Estate, Taxes on April 4, 2018 by Robert Paul.